Since our last early-season snow event on December 7th, the weather pattern over the Mid-South has transitioned into a much milder one, with occasional rain chances and brief cool-downs. As we head into the upcoming week, leading into Christmas, it appears this pattern will continue to hold. So does that mean no White Christmas for the Mid-South again this year? An early look at what may happen is coming up! After a return to colder temperatures in the Mid-South for a couple of days following the passage of a cold front, high pressure has shifted to our southeast again, meaning southerly winds, increasing moisture and milder temperatures are back as we typically see. After nearing 60 this afternoon, we’ll exceed it on Monday ahead of the next system organizing to our west. Mid and high level cloudiness will be increasing, but rain chances should hold off until at least Monday night. As the cold front and associated low pressure system approach late Monday night into Tuesday, rain will begin overspreading the area, with the wettest period between Tuesday morning and afternoon, when a few thunderstorms are possible. Fortunately, instability is expected to remain fairly minimal, meaning the chances of severe weather should be very low. Rainfall amounts will likely average around one-half of an inch, with local totals up to one inch possible. 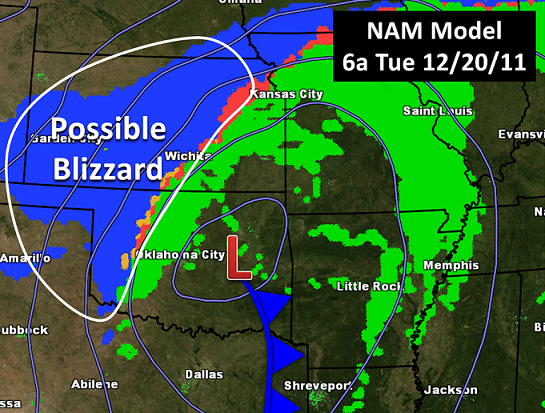 NAM model forecast for 6am Tuesday morning shows rain (possibly a few thunderstorms) moving into the Mid-South ahead of a cold front and low pressure area in Oklahoma; Meanwhile a blizzard may be ongoing across portions of the Plains states. This same storm system is expected to result in a major winter storm, with possibly blizzard conditions, across portions of New Mexico, Colorado, the Texas and Oklahoma Panhandles, and much of Kansas between Monday and Tuesday (see above). If you have any travel plans in that area, be aware that hazardous if not dangerous conditions are possible during this period. The front should clear the region Tuesday night, with slightly cooler weather for Wednesday and Thursday as highs fall back to the 50s. We’ll get a chance to dry out Wednesday, but not far behind will be the next system passing to our southeast Thursday. Unfortunately, computer models are not in agreement on how close it will be to the Mid-South, which will ultimately determine how much, if any, rainfall we might see. For now, a chance of rain exists for Thursday, but this is subject to change as the week progresses. Many are already looking forward to the expected weather for the all-important Christmas weekend, but so far confidence is not high as models are diverging on possible outcomes. Some are suggesting an unsettled pattern, which may result in chances for rain. For those “dreaming” of a White Christmas, it may have to remain that way yet another year as at this point temperatures do not look supportive of wintry precipitation. Of course, the forecast will become better defined in the coming days as new model data is available, allowing us to more confidently rule out any and all weather possibilities for Christmas weekend. Stay tuned!